Sketch J Showing the progress of the Survey of the Western Coast 1849-55. 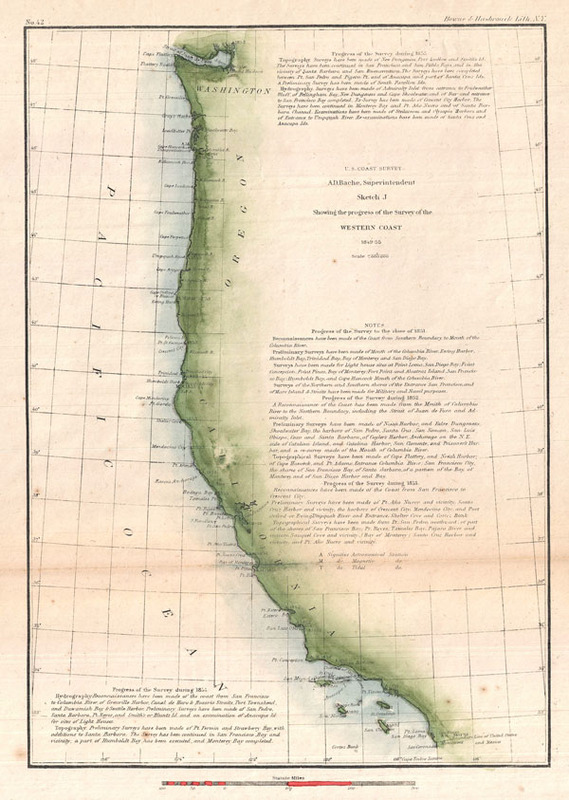 A rare hand colored 1855 costal chart of entire western coast of the United States, including California, Oregon and Washington. Depicts most important harbors and points. Several paragraphs of notes detail the state of the U.S. Coast Survey in the region from 1849 to 1855. Published under the supervision of A. D. Bache for the 1855 Report of the Superintendant of the U.S. Coast Survey. Very good condition. Original fold lines exhibit some toning and wear. Blank on verso.